bunch of new interviews and photos! I've also added a bunch of new videos including premiere footage, new interviews and more! Watch them all here in the video archive at Lewis Lovers. In addition I have added a TON of new photos to our gallery! Also just so you all know LewisLovers.com can also be found at Matthew-Lewis.com now :D YAY! Gaaah Matt.... another great interview. Mark Green from the National Media Museum in Bradford, England was kind enough to link me to his video interview with Matt, when he visited the museum this Monday just past. Matt talks mostly about his 'Potter' experience, and towards the end he mentions filming the scene from Deathly Hallows where Neville catches up with the trio in the Hog's Head :D He says the huge battle scene will be filmed in October. So excited for DH even more now! 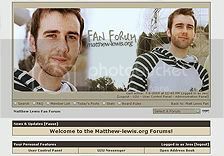 Matt Lewis Fan - a forum! So this has been a work-in-progress for a few weeks now, but I think it's about time I finally opened it up to the public. Thanks very much to reader Tara who initially gave me the idea :) I really hope all of Matt's fans can get involved. Haha. I changed the layout, and am still editing pages. I want to make it far simpler than it was before, but still keep a lot of the good stuff. IS GOING TO WORK NOW. Because we're using Cutenews instead of Fusion, so no errors :) Please subscribe to keep updated with the site! I figured that it's a good way of keeping in touch with fans and that. I'm on here every day, thought it'd be fun to keep people up to date! So if you want to add him his username is Mattdavelewis. Happy Twittering! Just wanted to let everyone know that Lewis Lovers has decided to do a birthday scrapbook for Matt!! I haven't gotten a deadline yet but we have at least until the middle of May, probably later. I won't be able to put it together until after I get out of school for the summer (May 20th) anyways. Click the image below for all the info. Just thought I would update you all on the conventions Matt will be attending this year. I'm in a rush so I will just post what I posted at LewisLovers. Matt has been added to the list of guests for this year's Florida Supercon. It will be taking place June 5th - June 7th at the Doubletree Miami Mart Airport Hotel and Convention Center in Miami. Collectormania has recently added Matthew to their list of Special Guests for their Collectormania: Midlands event at the the Hilton Birmingham Metropole Hotel (National Exhibition Centre, Birmingham, United Kingdom)on Saturday April 18th and Sunday 19th. Days for guests have not been confirmed, but I will update you when we know what days Matt will be there. 2. With this change comes a brand new layout and updated pages. The layout should be up within a week, however pages may take a little bit longer to be updated. Never fear - I will get around to it. 3. I've updated the gallery with some new (but old!) images plus screencaps of Half-Blood Prince TV spots that have been on recently. 4. The release date of Harry Potter and the Deathly Hallows: Part Two has been confirmed by Warner Bros to be released in theatres on the 20th July, 2011. Harry Potter and the Deathly Hallows: Part One will be released on 19th November, 2010. Both parts are currently being filmed in London, England. That's all I wanted to update you guys with. I'm hoping to get M-L.org back to how it used to be :) If there is anyone who wants to donate images, or anything of the sort, please email me and full credit will be given :) I could definitely use a helping hand. Question 4: What scene are you most looking forward to filming for Deathly Hallows? ML: Deathly Hallows is going to be so much fun to shoot. I don't have a script yet so I can't be exactly sure how everything is going to work out. However, I think my answer will be a bit predictable! The scene I'm looking forward to the most is when Neville swings the sword and kills Nagini. That is going to be intense! In fact, the whole final battle sequence is going to be amazing. Still can't believe they're going to trust me with a sword though!